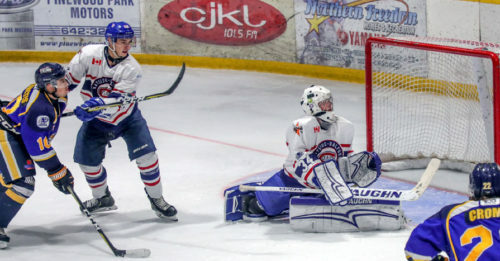 A pair of 2000 birth year puck-stoppers who have seen action with the Sudbury Wolves of the Ontario Hockey League are now standing tall with separate teams in the Northern Ontario Jr. Hockey League this season. David Bowen is tending twine with the Rayside Balfour Canadians while Marshall Frappier is guarding the net for the French River Rapids. Bowen played in parts of four OHL games with Sudbury in 2017-2018 and did well with a 1-1-0 record, .902 save percentage and 3.65 goals against average. Thus far with Rayside Balfour in 2018-2019, the 6-foot, 155-pound Bowen has a 6-4-1 record with a .906 save percentage and 3.24 goals against average on a Canadians team that has a record of 13-9-3. Frappier got into 22 OHL games with Sudbury in 2017-2018 and appeared in one match for the Wolves in 2018-2019 before being assigned to the NOJHL and French River. Since joining French River, the 6-foot-2, 185-pound Frappier has a 3-5-1 record, .909 save percentage and 3.55 goals against average on a Rapids team that has a record of 6-15-3. PHOTO: Goalie David Bowen of the Rayside Balfour Canadians, in NOJHL action against the Kirkland Lake Gold Miners.